Neubrain’s Performance-based Budgeting and business analytics solution is helping Park City, Utah reach better long- and short-term budget decisions attuned to outcomes. Stakeholders can now see more visible performance measures, timelier information, and easier identification of actual strategic priorities. The City is in an improved position to build more solid growth models, flag variances between costs and expected outcomes, improve auditability, and foster collaboration. Park City was incoroporated in 1884. 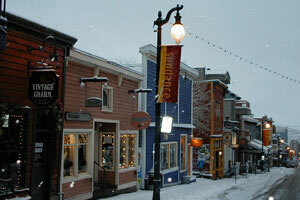 In the most recent decade it has been recognized as one of the top winter travel destination in U.S. Unfortunately, over the last four years Park City experienced rising labor costs, and a dramatic fall-off in revenue due to the ongoing recession. With budgeted expenses of $68.1 million for fiscal year 2013, population of roughly 7500, and 430 municipal employees, the City was in the process of making budgeting and personnel cuts, but had difficulty determining what costs, projects, and programs they should and should not be cutting, what taxes should be raised, and where they should be downsizing. The City also used a manual process for budget preparation, forecasting, allocation, consolidation, and performance tracking, which was very inadequate for the level of analysis required. The manual process required months worth of time commitment per cycle, was prone to error, required completed reprocessing if any changes were made to existing financial models. After trying a variety of stop gap solutions, and in an effort to be more transparent to its community, in 2010 the City decided to shift from Line-item Budgeting to Budgeting for Outcomes (BFO) methodology. Once the methodology has been successfully adopted, a benefit could not be achieved without an automated solution. The City partnered with Neubrain to further optimize processes through the use of a unified solution that can automate and integrate traditional budgeting with outcome budgeting methodology specific to the City. - Dramatically reduced budget cycle times from months to days. - Optimized, automated and integrated Budgeting for Outcome process by linking key performance measures with the budgeting process and ultimately creating a common language and culture with shared perspectives. - Provided tight integration with financial systems providing a single version of truth for all budgetary actual-to-date information, cost allocation and performance information. - Improved collaboration and communication between various stakeholders in the budgeting and outcome budgeting processes. - Implemented a real-time activity monitoring capability to track how money is spent and analyze the economic effects of those actions. - Improved analytical capabilities through a series of interactive reports, dashboards, forecasting and budget scenario analysis tools.